If your personal style tastes lean toward the dark side, you'll love the deliciously macabre "Terror Tome" Trinket Box! 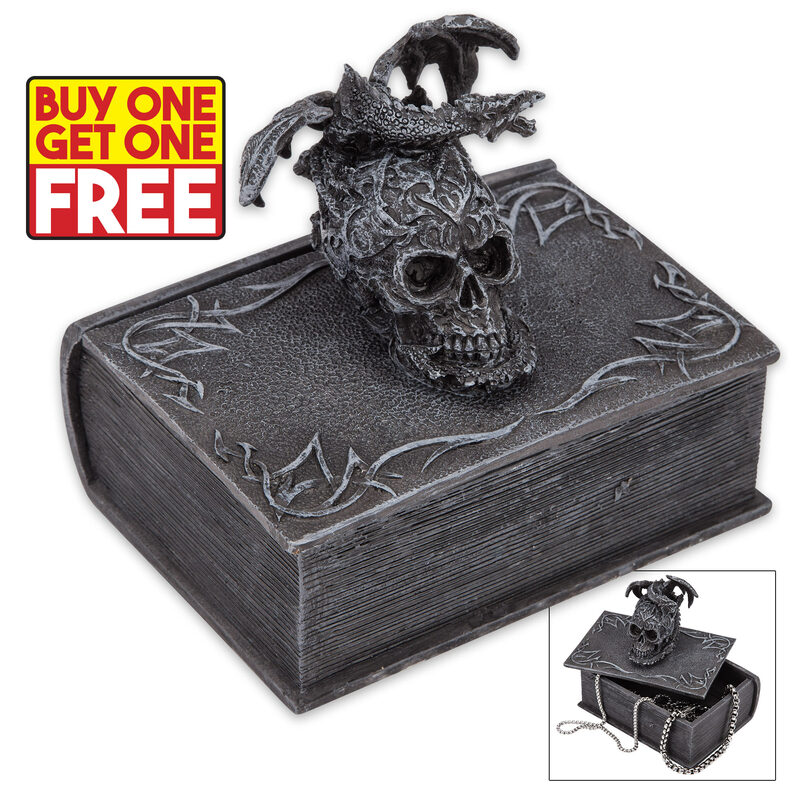 This eerie polyresin box is fashioned to mimic an ancient hardcover book, and the "front cover" - which cleverly doubles as a lid - is crowned by a ghoulish, pattern-adorned human skull grasped by a menacing winged dragon. Impeccably cast, this unique, striking piece is loaded with exquisite fine details like realistic deckle-edged pages and Celtic relief pattern binding. Remove the skull-and-dragon-topped "cover" to reveal a hidden cavity - perfect for holding jewelry, candy, office supplies, a stamp/rock/button/coin/other collection, cash, keys, beads and countless other small items. At 4 1/2" long x 3 1/4" wide x 4 1/2" high, it's amply sized for common curios and knickknacks but won't take up excessive space on an average desk, end table, bedside table or other compact space. Regardless of what you decide to do with it, you can be sure the "Terror Tome" Trinket Box will draw ample attention and praise. It also makes a fantastic gift for pirate enthusiasts, fans of the macabre or anyone who simply appreciates fine art and craftsmanship with a lurid sense of adventure and BOGO means you get one to give as a gift and one to keep for yourself!